Straps are made of hook and loop belts and are approximately 2 two feet in length. Shipping Supplies and Accessories can save time and money. 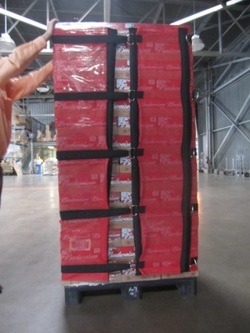 RFID Pallet Wraps Shipping Tracking Deploy the ability of RFID Asset Tracking is to help maintain the whereabouts of important assets that is fueling its growth. Specifically UHF (ultra high frequency) RFID is a perfect match for asset management and tracking and the return on investment for implementing an RFID infrastructure is very high. See the RFID Journal path here. Storage Bins Shipping Supplies Accessories All of our stock containers have 4-way entry for easy use with Lift Trucks, convenient drop gate design for easy access to products, and safety rating plates with static load capacity and static load height. 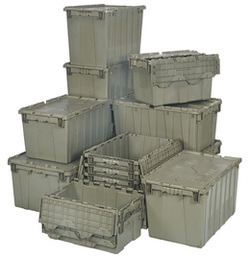 Custom sizes of Storage Bins are available so please request a quote for your specific needs. Strong, reliable and reusable totes are ideal for storage, distribution and order picking. Tops are permanently attached with steel hinges that interlock for stacking strength and security. Stack for maximized storage and nest when empty. Textured, non-slip bottom ensures smooth conveying. Ergonomically designed handles allow for easy lifting. Recessed lids ensure maximum load stability. Padlock eye provides security option allowing lids to be fastened and/or locked. Molded from high density, FDA approved polyethylene. Lids close securely to protect parts from dust or damage. Available in Gray.